Lucozade Powerleague, the UK’s largest 5-a-side football operator, has partnered with payment app Circle Pay to offer the biggest cash prize in 5-a-side history. #the50ktapin league starts this Autumn and is giving away £50,000 to one team. But it won’t necessarily be the league winners who get this windfall. Every team that turns up and plays all their games in the 14-week league will be entered into the free prize draw. This means that a team could lose all its games, not even score a goal, but still win the money. That would be quite a consolation prize! 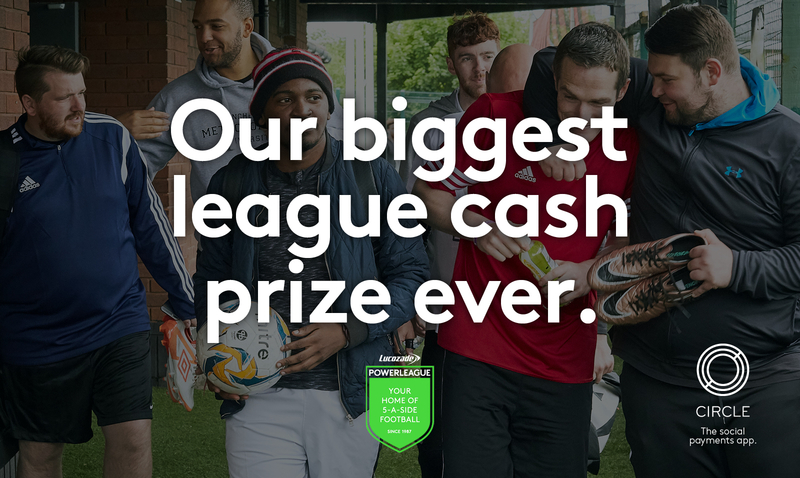 It’s a huge prize, and one that has been made possible through Powerleague’s partnership with payment app Circle Pay. It’s something that is intended to take some of the hassle of organising football, by taking care of the task of collecting in match fees. But there’s more to it than that – by offering such a big prize, it’s hoped that teams are going to be even less likely to commit the cardinal sin of not turning up for games. #50ktapin players who download the Circle app will be given a promotional code to win spot prizes throughout the 14-week league as well as a chance to win the £50k. For more details, and to sign up, visit Lucozade Powerleague’s website. Please note: 5-a-side.com is not affiliated either to Lucozade Powerleague or to Circle Pay, nor has it received any form of compensation in exchange for posting this article. We take no responsibility for the #50ktapin competition.